Erupting a volcano during a reading of Alien Shenanigans with a group of year 2 students at Telopea Park School. Emma the Eager Emu is helping me discuss her unique and special qualities to the children of Curtin South Preschool. Reading Gingerbread Aliens to an intrigued class of year 2 students at Fraser Primary school. As an experienced Primary school teacher, I enjoy the special occasions when I am invited into classrooms to share my stories and experiences with a wide range of wonderful children from preschool to year 6. I welcome the opportunity to visit schools in Canberra, surrounding regions throughout NSW and Sydney. Readings from any of my books depending on age group of children. Fun facts about Emus, other Australian birds and reptiles. Science experiment full of fun and excitement with a volcanic eruption. There’s a story in that! The planting of a seed of an idea. Writing interesting, intriguing and quirky characters. Structuring a story, there’s more than a beginning, middle and end. 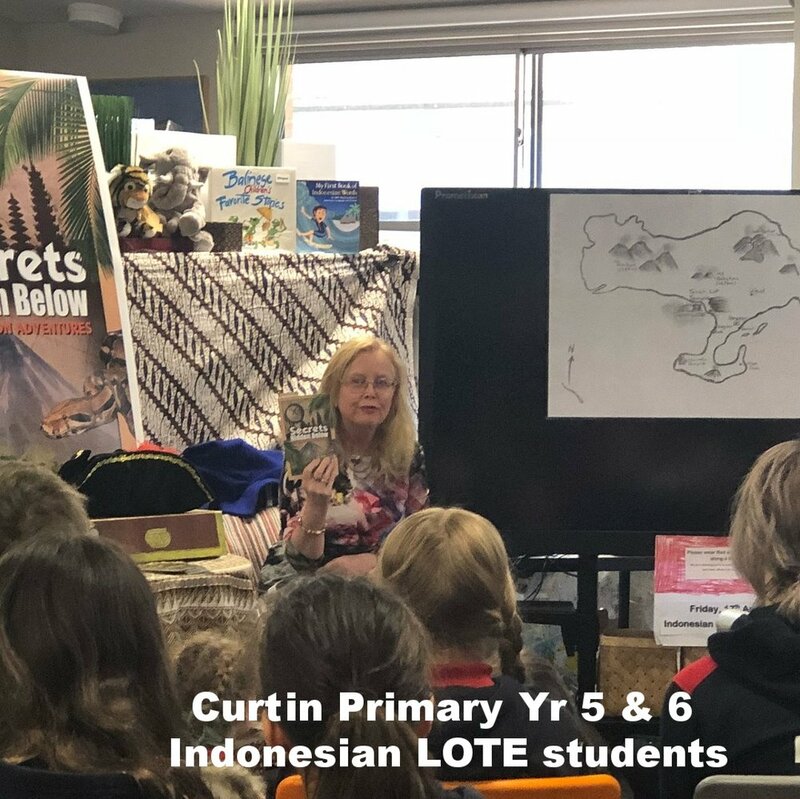 Curtin Primary - Indonesian LOTE students, Year 5-6. Forrest Primary - Years 5-6. Forrest Primary School - Writing workshop Year 5-6 students. The Year 5 and 6 students were really enthusiastic about the opportunity to participate in a writing workshop with Sandra. They were engaged the whole 90 minutes and excited to share their writing with Sandra and each other. Sandra shared her writing craft with the students and set up a structure for the students to follow to create their own stories. This was interspersed with pauses to receive the next twist to create excitement, adventure or emotion to their writing. It was lovely to see the students using their imaginations to craft their own adventures. The class teachers of the Year 5 and 6 students were delighted with the writing the students created in a short space of time and the parents of the students very grateful for the enrichment opportunity for their children. 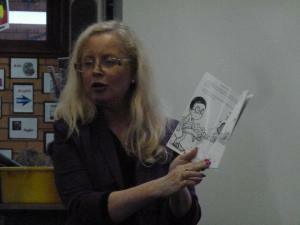 Macgregor Primary school felt privileged to welcome author Sandra Bennett to our school today. Sandra read to our Kindergarten students who were delighted to not only meet a real life author but to listen to Sandra read her very own stories with enthusiasm and passion. It’s with much excitement we add Sandra’s books to our library collection. Thank you Sandra! Emma the Eager Emu was a beautifully written book that all the children at my Childcare Centre loved. It highlights the differences between people in a lovely way that encourages children to both recognise and appreciate that we are all special. This book has become a regular in our story group times and the children cant wait to see what Emma does next, having heard that Sandra Bennett has another book in the pipelines. Both preschools this week have been very fortunate to have local author Sandra Bennett visit them. She shared her picture book ‘ Emma the eager emu’ . She discussed the unique and special qualities of emus and people. In sharing her story she used a puppet, a stuffed toy and an emu egg. It was a privilege for us to have you at Curtin this week Sandra Bennett. Thank you! Since your presentation was so successful in 2012 I would love you to come back and talk to the current year 2 students at Telopea. I’ve been reading your books to the children to their great enjoyment. Thank you so much for visiting Telopea Park School. The students enjoyed your presentation immensely as well as reading your very humorous books. I hope you sold lots of books on the day which again demonstrates the appeal of your writing. Thank you also for sending the follow up material which I will pass on to the children.